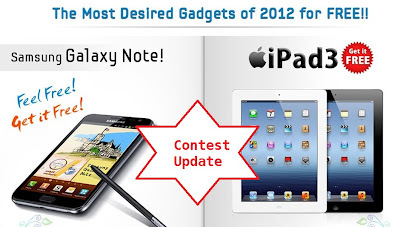 Thanks everyone for such an amazing participation in "The Most Desired Gadget of 2012 for Free" contest. We have received more than 20,000 participation in less than two weeks. Both the contest are closed & this is the time to announce winners. So, without doing too much ado, we now present winners. If your name is not in the list, don't worry, participants with more than 5 successful registered referrals for Galaxy Note contest & more than 3 successful registered referrals for iPad contest will get their respective Gift Vouchers before 27th March 2012. I referred more than 20 people in both the contests.